If every dot represents the addition of 0.1 g of the respective base. 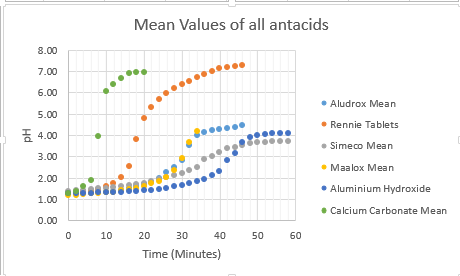 I suppose that the best would be the one that reaches the highest pH, in the shortest time, for example Calcium Carbonate, but if that is true, why are other antacids used that reach lower pH? Normally, the efficacy of a drug is determined by the area under the curve of the entire time course of the drug in the body. The graphs here only show the initial rate of the change in pH but not the entire time course after the peak pH is reached. I assumed that these results were generated by an acid-base titration experiment in the laboratory and not generated in vivo. Therefore I cannot answer which antacid is more effective and/or clinically safe. Although calcium carbonate shows a rapid initial rate of pH neutralization, it may not be suitable for all patients. Too rapid a pH rise in the digestive tract may cause nausea and vomiting and may trigger an “acid rebound”, meaning that the body tries to compensate by secreting more acid to maintain the normal gastric pH for food digestion, making the heartburn even more unbearable. Some patients take calcium carbonate as a source of calcium, but one also needs vitamin D in order for the calcium to be absorbed. Besides, calcium carbonate yields carbon dioxide gas with acid which is still acidic, and bloating. For patients with compromised parathyroid function, too much calcium in the blood (hypercalcemia) after the bones are already saturated with calcium may start to deposit in the heart and in the kidneys to form calcium oxalate kidney stones (different from uric acid stone). Therefore calcium antacid may not be the best antacid for all patients. If calcium antacid is not tolerable, one can use aluminum hydroxide (Aludrox®) which is a good alternative. However aluminum hydroxide can cause constipation. Magnesium hydroxide (milk of magnesia) is another good alternative, but magnesium hydroxide can cause diarrhea because magnesium is a smooth muscle relaxant. Therefore the product Maalox® or Mylanta® which combines aluminum hydroxide with magnesium hydroxide will be easier on the stomach. Also, there are products that contain simethicone (which is an anti-flatulent) as an extra ingredient to help with bloating. The choices for an antacid are out there, make a good, sound one. Not the answer you're looking for? Browse other questions tagged acid-base ph drugs medicinal-chemistry or ask your own question. Why do alkaline breads bake browner/crustier?